Over 80% of the Fortune 100 Companies use the Myers-Briggs Type Indicator as the tool of choice for organizational effectiveness. This course will focus on understanding personality type in relation to acute and chronic stress reactions. Understanding how to utilize strengths and recognizing opportunities for growth is the key to decreasing workplace stress. You will explore personality type in areas including: stress management, time management, networking skills and navigating through organizational changes. Business Professionals experiencing a high level of stress in the workplace. As a Certified Myers-Briggs Practitioner and President of Clarity Coaching & Development, Jolene Watson offers organizational team building/stress management/goal setting workshops, professional speaking and career coaching. Jolene has graduated from various programs such as Praxis School of Entrepreneurship, Psychometrics Canada Ltd. and Dale Carnegie Training. She received the Advanced Communicator and Competent Leader awards from years of being a dedicated member of Toastmasters International. 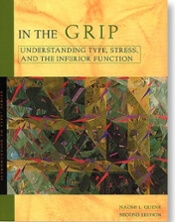 Receive a complimentary copy of the type book In the Grip by Psychometrics Canada along with your MBTI Step I Stress Management Report.